The ubiquitous art of coloring Easter eggs has gotten weird, as every year marketers try to make your kids want to buy something ever more elaborate, just to dye Easter eggs. Mind you, I’m not the grumpy neighbor who stops shouting “Get off my lawn!” around Easter just so that I can start shouting, “Stop decorating your eggs all weird!” I am ALL ABOUT doing weird stuff, whether it’s coloring Easter eggs, crafting with cardboard, hacking Crayola markers, or whatever else you try to hand me. I just don’t think that you have to buy a slickly-marketed, overly-packaged, plastic-product kit just so that you can do something weird to your Easter eggs. 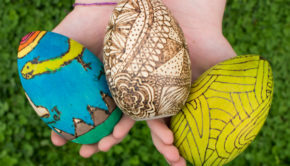 There are so many weird things that you can do to Easter eggs just using your own stuff, or stuff from the thrift store, or stuff that you found in your yard. 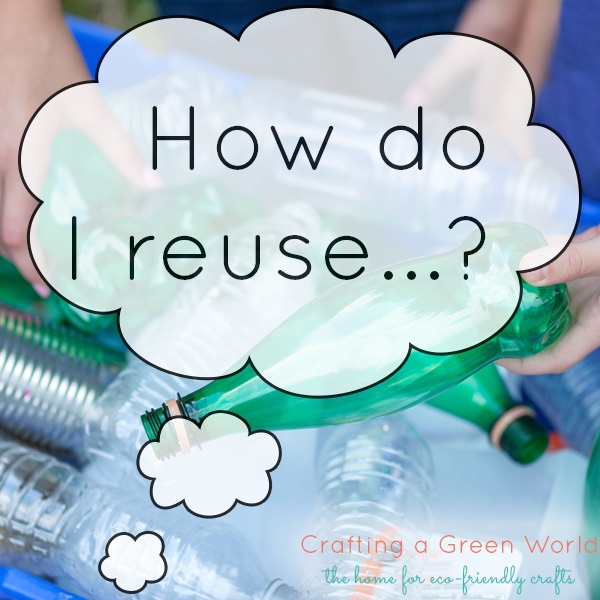 Bonus points: these methods, since they’re using natural or recycled/upcycled components, are also much more eco-friendly than what you’ll find at the store. 1. baking soda eggs. 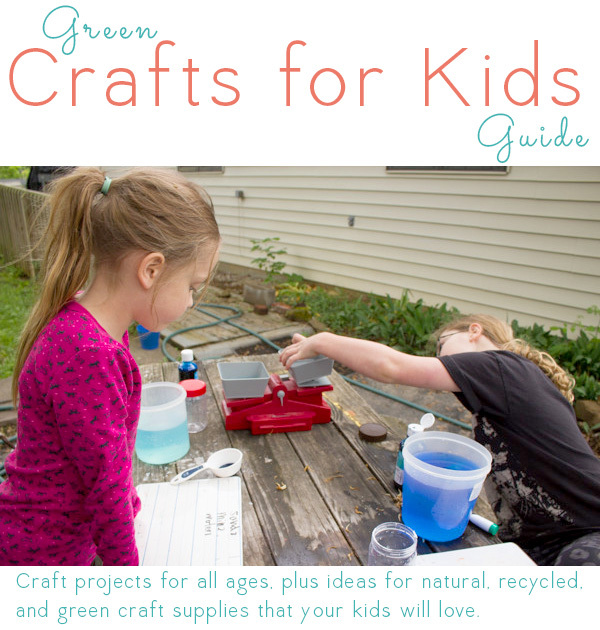 This is a fun craft project/chemistry demonstration, especially for a younger kid. 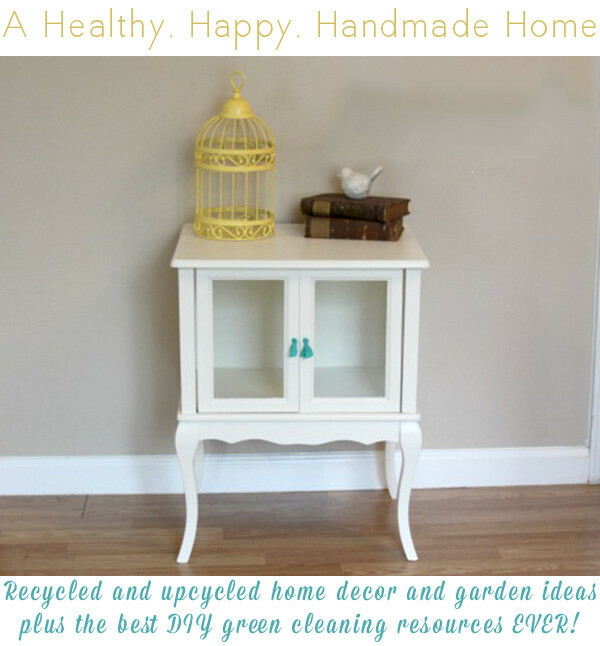 2. chalkboard paint Easter eggs. If you’ve got a kid who wants to color their Easter eggs over and over and OVER, make these chalkboard paint Easter eggs and then let the kid loose with some chalk pastels and a wet cloth. 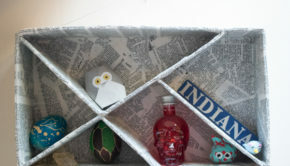 3. decoupaged Easter eggs. Okay, these eggs aren’t dyed. 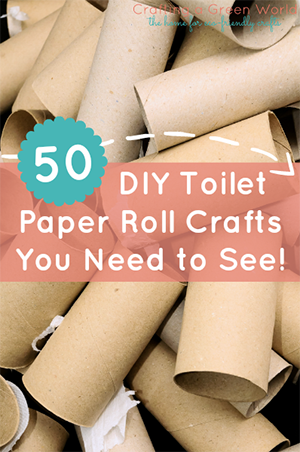 But if you’re sick of coloring Easter eggs with dye, then take a break and decoupage a few. They’ll turn out really pretty! 4. dyed hard-boiled eggs. 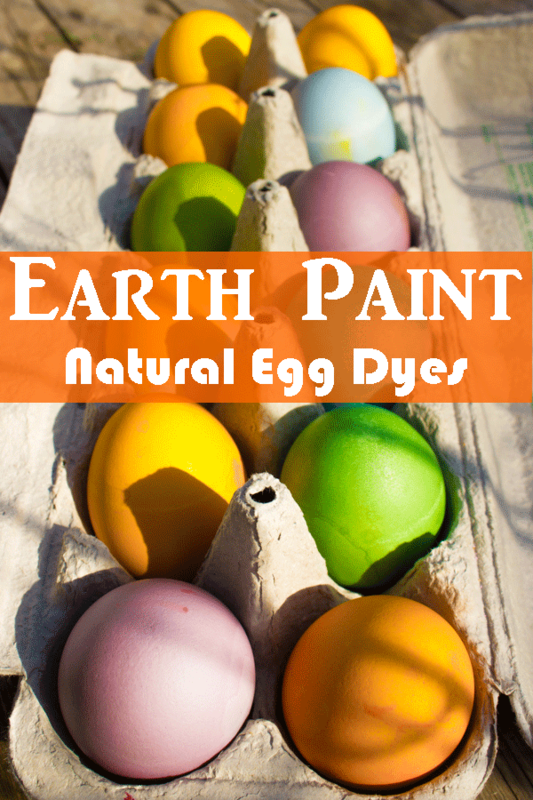 Use natural food dye with this method, since it dyes the actual hard-boiled egg that you’ll be eating. 5. Earth Paint eggs. 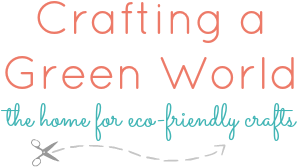 You don’t have to give up the convenience of an egg-dyeing kit just to be eco-friendly. 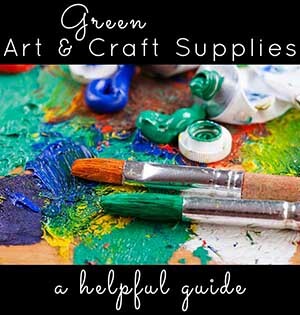 If your kids have their hearts set on a kit, this Earth Paint kit is an eco-friendly choice. 6. Easter bread. This is something a little different to do with your dyed eggs. 7. eggs painted in acrylics. If you’ve already got acrylic paints in your stash, and you want something elaborate, why bother coloring Easter eggs with dye at all? Whip out your paint set, and make it happen! 8. gold leaf Easter eggs. 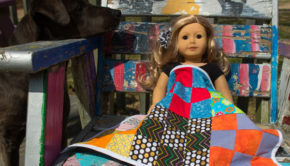 This is NOT a kids’ craft! Take your Easter eggs, dyed or not, to the next level by adding gold leaf. 9. Kool-aid Easter eggs. Even at eight and ten, my kids still believe that Kool-aid is primarily a craft supply. These Easter eggs colored with Kool-aid look beautiful and smell great. 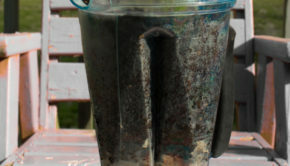 Kool-aid is non-toxic and technically a food, so these dyes are, if not “natural,” at least safe to put in your mouth. 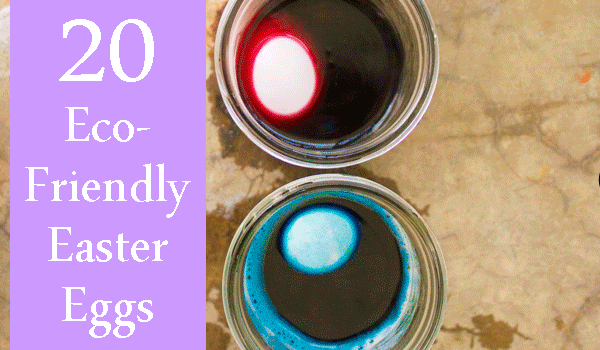 10. natural egg dyes. We’re way beyond beige or light green here. Follow these recipes to get the cute colors that your kids crave. 11. ombre Easter eggs. This is a super cool technique to make ombre eggs. The hipsters in your family are going to be thrilled! 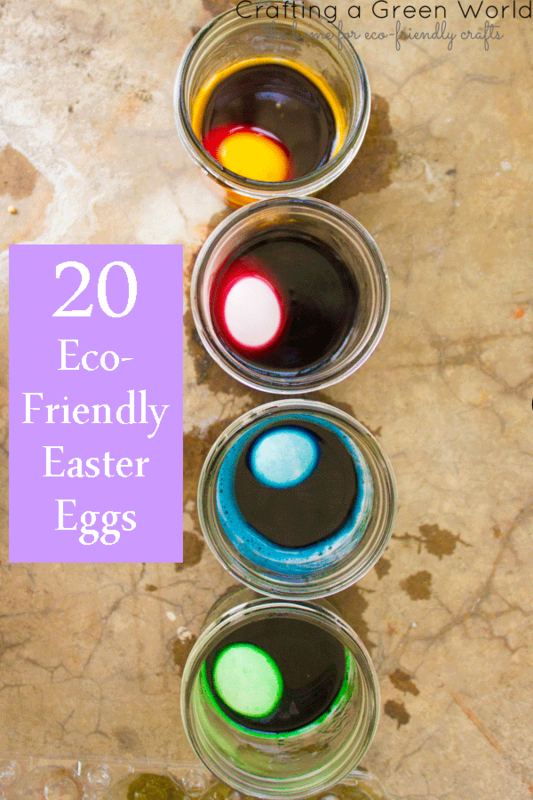 12. reverse-dyed nature eggs. With some delicate greenery and an old pair of tights, you can make these beautiful reverse-dyed eggs that seem stenciled by the natural world. 13. Sharpie-dyed eggs. Sharpies aren’t eco-friendly, so be mindful if you have sensitive skin, BUT if you’ve got them in your stash already, you can skip buying the special egg dyes. 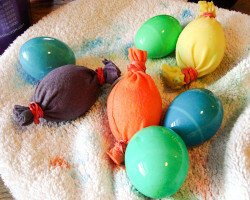 14. shaving cream-dyed eggs. Whatever dye you use, also use shaving cream to allow the swirling colors to sit and really seep in. 15. silk-dyed eggs. Old silk ties, found at any thrift store (or your granddad’s house), are the secret component to making these awesome-looking Easter eggs. 16. stamped Easter eggs. If you’ve already got stamps and an ink pad in your stash, then you’ve got everything that you need to make these Easter eggs. 17. tie-dye eggs. 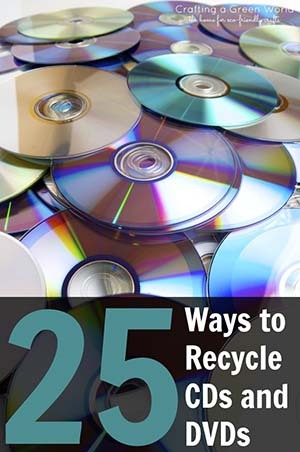 Discover the weird designs that your Easter eggs can sport just by ripping up an old cotton T-shirt first. 18. watercolor eggs. Use metal spoons instead of plastic, of course (the dye shouldn’t stain the metal), but otherwise, complete the tutorial as directed and enjoy the watercolor effect! 19. wreath-crowned Easter eggs. Make a sweet little flower wreath for your most special eggs. 20. yarn-wrapped eggs. The tutorial calls for plastic Easter eggs, but you can also do this with blown eggs.